Homemade soap makes a wonderful gift for the Christmas season. It also makes a pleasant smelling accessory for your guest bathrooms when relatives descend for the holidays. Try making any of these Christmas soap recipes to add something special to your holiday this year. Melt and pour soap is easy enough for even the most novice soap maker. Children with proper supervision may also enjoy making this soap. Place the soap base and peppermint fragrance oil in the top half of a double boiler. Bring the water in the bottom of the double boiler to a boil and heat the soap base and oil until they melt. Stir gently to combine and remove from heat. Pour the soap base onto the cookie sheet and immediately pour the gel into the mixture. Swirl the red coloring through the melted soap with a butter knife. Let the soap cool completely until hard. Slide the butter knife around the edge of the cookie sheet to loosen the soap and pop the entire sheet free. 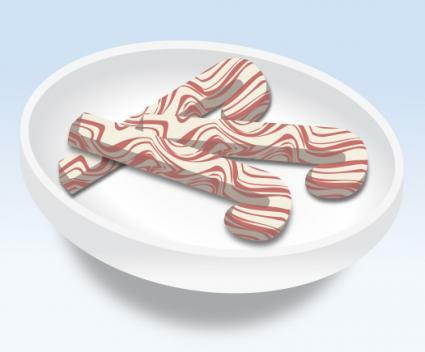 Cut up the soap using the candy cane shaped cookie cutter and wrap with cling wrap until ready to use. 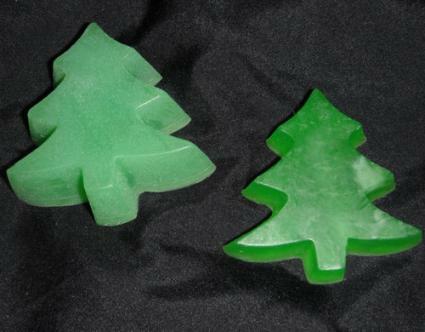 This glycerin soap looks and smells like a Christmas tree. Make it in Christmas tree-shaped molds, or the mold of your choice. Glycerin soap uses the same basic melt and pour method, so you can whip up several batches in an afternoon. Melt the soap base, fragrance oil and coloring gel together in the top half of a double boiler. Pour the resulting liquid into tree-shaped molds. Spray the tops with rubbing alcohol to remove surface bubbles. Allow to harden and remove from the molds. Let sit for 48 hours on a drying rack, then wrap in plastic wrap until ready to use. 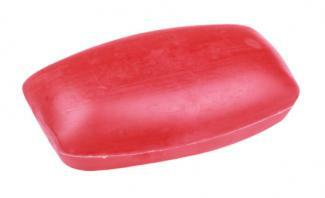 This lye-based soap smells of cinnamon; pour it into any shaped mold you like with or without a Christmas theme. Before working with lye, make sure you read and understand all of the safety rules and precautions. Heat the oil until it reaches 120 degrees F.
In a separate pan, add the water to the lye, stirring carefully with a wooden spoon. Heat the lye mixture to approximately 100 degrees, then add to the oil. Mix them together until it reaches trace, or is thick enough that a small amount of soap brought to the surface takes a moment to settle back down. Add the oil and coloring at this point and mix well. Pour into a mold and let set for 72 hours. The soap is now safe to use, but letting it sit and "cure" for a couple of weeks can make the bar harder and milder. Turn out of the mold and store in a cool, dry place. Homemade soap is one gift that is sure to get plenty of use this Christmas season. Make some seasonally appropriate soaps using any of these recipes and give your guests - and yourself - some sweet-smelling treats this year.